NIOT Chennai Recruitment 2018-2019 for 21 Research Associate (RA), Senior Research Fellow (SRF), Junior Research Fellow (JRF) Posts Apply Online through Official website www.niot.res.in. NIOT Chennai Research Associate (RA), SRF, JRF Jobs Notification 2018 Released The Interested and Eligible Candidates are requested to apply online through Official website www.niot.res.in. The last date for submission of Online applications is 09.02.2018. NIOT Chennai 2018 Notification - Apply Online More Job Details Scroll Down. 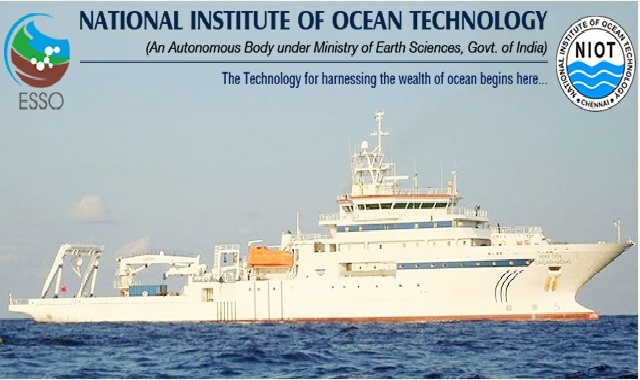 Research Associate (RA) - Ph.D (Oceanography /Physical Oceanography /Marine Geophysics/ Marine Geology) (OR) M.Tech Ocean technology /Oceanography /Physical oceanography /Marine geophysics /Marine geology with three years R&D experience and one publication in standard refereed journals as listed in JCR. Hard Copies of the signed application (registered online) along with photocopies of (i) ID proof (ii) Proof of Date of Birth (iii) Educational Certificates: Mark-Sheets/Degree Certificate (iv) Caste and attested copies of relevant documents should be addressed to “The Director, National Institute of Ocean Technology, Velachery - Tambaram Main Road, Pallikaranai, Chennai - 600100” by post so as to reach us by 16.02.2018.